Compact cameras with 30x optical zoom are becoming fairly commonplace, but the Sony Cyber-shot DSC-WX500 stands out from the crowd by being noticeably smaller than the competition. It’s a pity this comes at the expense of ergonomics though, as the camera could really benefit from better gripping points. The only other significant shortcoming with the Sony Cyber-shot DSC-WX500 is that you don’t get an electronic viewfinder. But that’s no surprise at this price, as whilst the Panasonic TZ70 and Sony’s HX90V do pack an EVF, they’ll also set you back more money. Ultra HD video recording would also help for future-proofing, but again, this is a feature that’s yet to trickle down to cameras at this price point. The WX500’s lack of raw recording could also be considered a drawback, but as explained in the image quality section, this needn’t be a big worry. We’ve got no complaints with the Sony Cyber-shot DSC-WX500’s image quality and performance though. Sony’s 18.2-megapixel Exmor R sensor and Bionz X processor are capable of producing photos with high detail levels and well-controlled image noise with little evidence of image smoothing. Performance at higher ISO settings is also good, although the Panasonic TZ70 offers similar quality. The WX500 also offers a decent range of creative effects, manual shooting options and terrific battery life. Currently the Sony Cyber-shot DSC-WX500 is priced somewhat higher than rival cameras like the Canon SX710 HS and Nikon S9900, but this will likely drop in the coming months. However, if you really want to save cash, yet want the WX500’s compactness, performance and image quality, then consider the WX350. 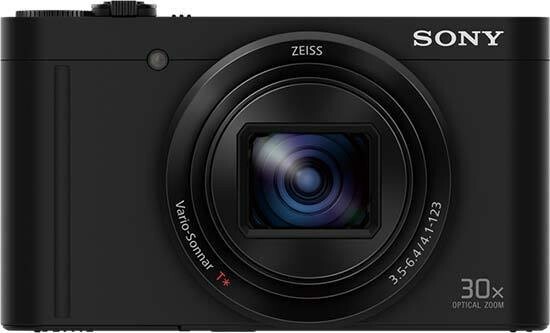 It may only pack 20x optical zoom, but you’ll get the same sensor and processor combo in an even smaller package. Even at its present retail price of around £271/$328, the Sony Cyber-shot DSC-WX500 is an excellent choice if you’re looking for a versatile, travel-orientated compact camera with class-leading performance, providing you favour outright portability over ergonomics.